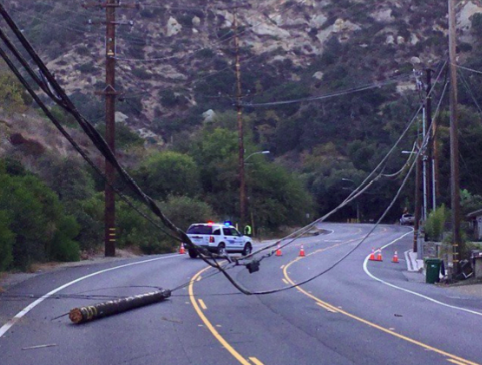 Downed utility lines forced the closure of Laguna Canyon Road last October, one of the safety risks city officials hope to eliminate by burying wires. The Laguna Beach City Council voted unanimously Tuesday, July 17, to let voters decide the fate of a proposed one-cent sales tax hike that would generate funds for burying utility poles along Laguna Canyon Road and other local evacuation routes. After listening to dozens of residents speak on the issue, the council agreed to pursue a special purpose sales tax, which requires a two-thirds majority vote to pass and earmarks the funds for specific uses that can only be altered by a vote of the public. A general purpose tax measure, which only needs a simply majority for passage, would have allowed future councils to determine how the funds should be spent. Also per the recommendation of residents, the council decided to create a sunset clause in the ballot measure that states the sales tax would conclude within 25 years. The proposed ballot measure, if approved, would raise local sales tax to 8.75 percent from 7.75 percent, or a 12.9 percent increase, which would be the highest in the county. City staff said the measure is part of the ongoing work officials have done to address fire risk and evacuation issues since 2015. Over the last year, staff and a council subcommittee have focused their efforts on finding funding for the project, estimated to cost $115 million to $135 million. To gather public input on funding the project, the city hired a consultant to conduct two surveys of residents. The second survey’s results, presented in May, showed about 76 percent of voters were at least somewhat supportive of undergrounding utilities, and 65 percent of those surveyed would support a one-cent sales tax. Staff proposed a combination of funding sources to pay for the undergrounding of 12 key evacuation routes—the one-cent sales tax, which could raise $5.6 million per year and support an $80 million bond, and $2.5 million in annual city revenue from existing sources, which could support a $35 million bond. The city’s contribution would consist of $1 million from Measure LL, $800,000 from the city’s parking fund and $700,000 from the street lighting fund. The combination of funds would ideally cover the $8 million per year in bond debt service required for the low estimate of the total project cost of $115 million. At least 50 residents and community leaders filled City Hall Tuesday to listen to and debate the merits of utilizing a sales tax hike to underground utility wiring. More than 30 residents spoke during public comment both for and against the ballot measure proposal, with audience members waving their hands in favor or waving paper stop signs in opposition. Proponents of the measure spoke about the need for improved public safety along evacuation routes due to amplified fire danger, the aesthetic benefits of burying utility wires, and argued against relying on solar power to replace utilities. “Wireless is not the solution. It is years in the future. It’s not developed, and even if it is, the cost per homeowner could be exorbitant and not all homeowners will take advantage of it,” said Tom Gibbs, of the Underground Laguna Now advocacy group. Opponents listed many concerns with the sales tax hike and ballot measure language, including a clause that states residents will be unable to initiate a referendum to repeal the tax if there’s a bond in place. Council member Steve Dicterow asked City Attorney Phil Kohn to clarify that point, and he confirmed that per the ballot measure language, if there was a bond that is dependent on the tax revenue stream, residents would be unable to eliminate that revenue stream. Emil Monda, president of Laguna Beach Republicans, expressed opposition to the measure, saying the town has enough taxes and that many people can’t afford an extra 1 percent sales tax. Members of the group S.T.O.P (Stop Taxing Our Property) requested that the city remove vague language in the measure that allows for spending on “other safety measures and improvements” and “other areas” beyond the listed evacuation routes. They also called for an oversight committee to be selected from a blind pool of residents with the authority to veto expenditures they don’t deem consistent with the measure’s purpose. Resident Michael Morris said he feels the city may be rushing the ballot measure on purpose. “This has been a rush to get this on the ballot, and perhaps it is because come April 15, 2019, lots of residents in Laguna Beach are going to find that their federal tax burden has increased dramatically and their appetite for new local taxes is going to decrease,” Morris said. Bloomberg recently reported that 8.6 percent of California taxpayers will owe more in 2019 as a result of the recent U.S. tax code overhaul. During the discussion, Dicterow said he would vote to put the measure on the ballot so the public can voice their opinions. He personally disapproves of the tax, calling it as fiscally irresponsible. Council member Bob Whalen, who has taken the lead on this initiative, responded to critics. He said the measure hasn’t been rushed or hidden and is the culmination of three years of analysis.